As part of our Bicentennial festivities, we are celebrating with a COLOR RUN! Bring the whole family for a fun run or walk as participants are doused from head to toe in different colors. This fun filled event will be one of many leading up to the Bicentennial Festival to be held on November 9-11. 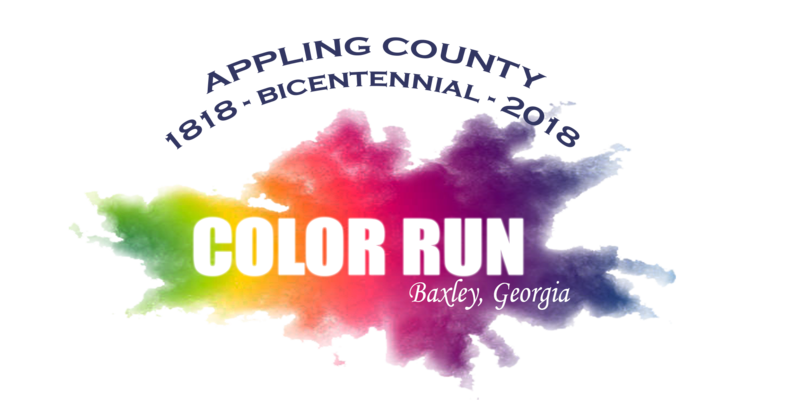 Bicentennial Festival Color Run T-shirt is included in pre-registration. The above fee entitles participant to enter 1 mile Fun Run and/or 5K. Pre-register at the Baxley-Appling County Chamber of Commerce, 305 W Parker St, Baxley, GA 31513 and active.com through 5:00 p.m. October 5, 2018. Races begin promptly @ scheduled start time. Please arrive 15 minutes before race time.